Terminal 3 at Dubai Airport cost US$8 billion to build and was originally exclusively used by Emirates Airlines, however due to an extensive code sharing agreement with Qantas this is no longer the case. Qantas would be the second and only one of 2 airlines to fly in and out of Terminal 3, this deal also allows Qantas to use the A380 dedicated concourse. Terminal 3 is able to handle an annual capacity of 47 million passengers. Terminal 3 at Dubai International Airport has 5 Airbus A380 gates at Concourse B, and 18 at Concourse A. The Terminal 3 building consists of 82 moving walkways, 97 escalators, 8 sky-trains (4 each at Arrivals and Departures), 157 elevators, and 27 truck lifts. Terminal 3 at Dubai Airport is in fact the largest building in the world by floor space, with over 1,700,000 m2 (18,440,000 sq ft) of space which is currently capable of handling 60 million passengers a year. A large part of Terminal 3 at Dubai Airport is located underground and under the taxiway area where the Terminal is directly connected to Concourse B. The departures and arrivals halls have been operational since October 2008 and are actually 10 metres beneath the airport’s apron. The Terminal includes a multi level underground structure, first and business class lounges, restaurants, 72 immigration counters and 1,870 car-parking spaces, 168 car rental spaces and 45 Emirates bus spaces. The baggage handling system at Dubai Airports Terminal 3 really is something else and is the largest and deepest in the world which can handle up to 8,000 bags per hour. The system includes 21 screening injection points, 49 make-up carousals, 90 km of conveyor belts capable of handling 15,000 items per hour at a speed of 27kmh, and 4,500 early baggage storage positions. Departures at Terminal 3 Dubai Airport includes 126 check-in counters for economy class passengers and 36 for first and business class passengers. There is also 18 self service kiosks, 3 lounges for unaccompanied minors, 38 counters with 12 e-gates for Economy class passengers and 10 counters with 4 e-gates for First & Business class passengers at immigration for Dubai Airport Terminal 3 Departures. Emirates Terminal 3 at Dubai Airport is situated on Airport Road in Garhoud and just a few kilometres from the majority of Dubai’s main centres. Please keep in mind that at peak times traffic on the main routes to and from Dubai Airport can cause delays if you are travelling by car, bus or taxi. Dubai Airport’s Terminal 3 is also well connected by the public transport service in Dubai. Taxis in Dubai are easy to find in most areas and there is also a dedicated taxi stand situated at Emirates Terminal 3 Arrivals. The Dubai Metro Red Line stops at both Emirates Terminal 3 and Dubai Airport Terminal 1 which offers passengers a convenient link to Dubai city. Visit our dedicated page on the Dubai Metro for more information about this great pubic transport system in Dubai. A number of bus routes in Dubai also serve Dubai Airport. To plan your bus route and journey in Dubai you can use the Dubai Roads and Transport Authority’s Wojhati journey planner to find the best route. The “Wojhati” or Journey Planner is an electronic system that enables passengers who are planning on using the public transport system in Dubai to find the best way to travel through real-time and accurate information with regards to the passenger’s location, destination and trip time. Passengers at Dubai Airport can easily walk between Terminal 1 and Emirates Terminal 3 when transferring between flights at Dubai Airport. The walk between these Terminals takes no more than 20 minutes and there are travelators and escalators to assist you. For the convenience of passengers transitting through Dubai Airports Terminals, buggies are provided to transport you within the terminal buildings but not between the terminals themselves. 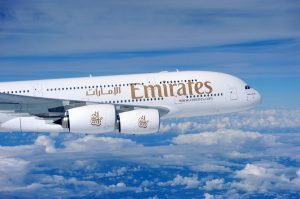 Passengers transferring with Emirates to or from certain flydubai flights from Terminal 2 can take advantage of Emirates dedicated transfer service. Other passengers transferring through Terminal 2 at Dubai Airport should proceed through the Arrivals hall and collect all baggage at Baggage Reclaim then transfer to their connecting terminal using public transport or other private transport links. If you would like to view a detailed map of the Emirates Terminal 3 building at Dubai Airport click either of the two links below. Concourse A part of Terminal 3 has a capacity of 19 million passengers and is connected to the 2 major public levels of Terminal 3 via an automated people mover (APM) in addition to the vehicular and baggage handling system utility tunnels for further transfer. Concourse A at Dubai Airport opened on 2nd January 2013 and was built at a cost of US$3.3 billion. The building, which follows the characteristic shape of Concourse B, 924 m (3,031 ft) long, 91 m (299 ft) wide and 40 m (130 ft) high in the centre from the apron level, and accommodates 20 air bridge gates, of which all are capable of handling the Airbus A380-800. There is also 6 remote lounges for passengers departing on flights parked at 13 remote stands. The gates in concourse A are labelled A1- A24. Concourse A includes one 4 star hotel and one 5 star hotel, first and business class lounges, and duty-free areas. The total built-up area is 540,000 m2 (5,800,000 sq ft). The concourse allows for multi-level boarding and boasts the largest first and business class lounges in the world. Each lounge has its own dedicated floor offering direct aircraft access from the lounges. The total amount of retail space at the concourse is 11,000 m2 (120,000 sq ft), and there is also a total of 14 cafe’s and restaurants. Concourse B at Dubai Airport is directly connected to the Terminal 3 building. The total built up area of Concourse B itself is 675,000 m2. Dubai Airports Concourse B at Terminal 3 is 945 metres long, 90.8 metres wide and 39.5 metres high. The Concourse B at Terminal 3 has 10 floors (4 basement, Ground Floor, and 5 upper floors). The Concourse is a multi-level structure for departures and arrivals and includes 32 gates, labelled B1 to B32. Concourse B at Dubai Airport also consists of 14 remote stands for Airbus A340’s and Boeing 777’s only. The remote gates at Concourse B have 5 boarding lounges and transit passengers are also well catered for with 62 transfer desks spread out across 3 transfer areas. Concourse B at Terminal 3 also houses the Emirates first and Business class lounges and the Marhaba lounge. The First class lounge has a total area of 12,600 m2 with a capacity for 1,800 passengers. The business class lounge at Concourse B is slightly bigger and can accommodate a capacity of 3000 passengers. The Marhaba lounge is the smallest lounge at Concourse B which can handle a capacity of 300 passengers at a time. Passengers travelling through Dubai Airports Concourse B can have something to eat or drink at one of 18 restaurants within the Food Court or enjoy some shopping within the total retail area of 10,700 m2 which is completely operated by Dubai Duty Free. The concourse also has 2 hotels, a 193 room and 14 suite 4 star hotel, and a 38 room and 8 suite 5 star hotel. There is a direct connection from Concourse B at Terminal 3 to the Sheikh Rashid Terminal (Concourse C) which is located at the control tower structure through the passenger walkways. If you would like to view a video tour of the Emirates Terminal 3 building at Dubai Airport click the link below.